Back east hemmed in by the heat, the tall buildings and trees teeming with insects, I often think of the west and its honey-colored canyons. Being in the desert fulfilled a dream from long ago when the swing would point west and I would close my eyes in the setting sun and think of cowboys, stream trains and cacti crowding the skyline. 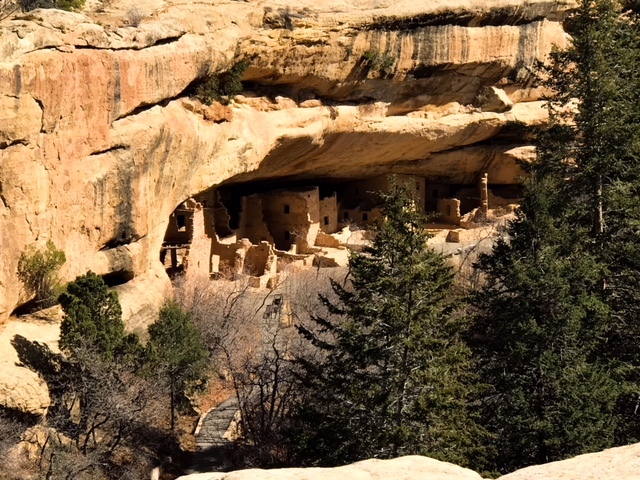 The old cliff dwellings of Mesa Verdi in Colorado live on in my imagination now. I think of the faraway world of the ancient people and the words of Willa Cather from The Song of the Lark. "From the ancient dwelling there came always a dignified, unobtrusive sadness; now stronger, now fainter - like the aromatic smell which the dwarf cedars gave out in the sun - but always present, a part of the air one breathed. At night when Thea dreamed about the anyon - or in the early morning when she hurried toward it, anticipating it - her conception of it was of yellow rocks baking in the sunlight the swallows, the cedar smell, and that peculiar sadness - a voice out of the past, not very loud, that went on saying a few simple things to the solitude eternally." 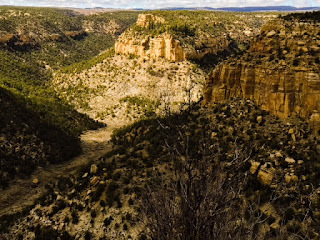 Cather has always encapsulated the feel of the West, the loneliness, and the promise. The melancholy ghosts of the past. 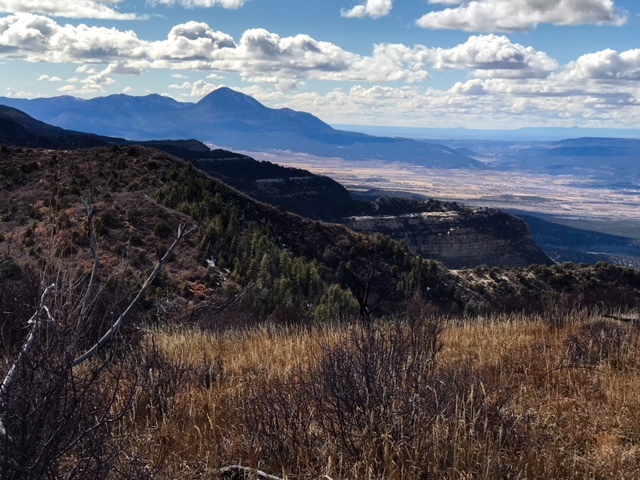 The Ancestral Pueblo people made Mesa Verde their home for 700 years but in the end, their simple dream of living off the land died. In a precursor of what was to come, they used up the resources and could no longer sustain themselves. Still, the dream of waking up and falling asleep to the rhythms of the canyon lives on in the quiet places under the cliffs. In Mesa Verde, I found myself alone in the honey-colored canyons. There was no cellphone coverage and 21st Century distractions. Just a simple museum with a visitor center, the serene cliff houses, the skeletal desert trees and the buzzards circling overhead. I was passing out of one world into another for the afternoon. I took the Petroglyph Trail, walking briskly in the still chilly afternoon sunshine. 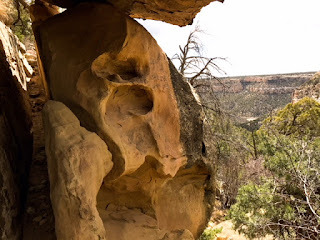 I was alone on much of the trail that traverses the side of the canyon. I took a guidebook and stopped at many of the markers along the way to read the descriptions. 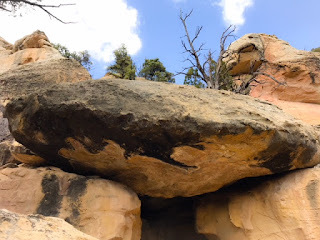 It struck me that in this age of information overload and the 24-hour news cycle, how little I knew about these plants that sustained the Pueblo people, how little I knew about the bedrock of life hundreds of years ago. In the desert, I found a search for knowledge and a world miles away from our money-obsessed existence. At least for an afternoon. Without the guidebook, I would not have recognized Mormon Tea or known its leaves are merely small scales that aid in conserving water. Mexicans, Indians, and early Mormon pioneers brewed a tea from the stems of this plant and it was used to cure a raft of diseases. The pinyon pine had been ripped open by porcupines exposing wounds on the tree, allowing organisms to infect it; a large juniper was infected by bark beetles. If porcupines damage too many trees, their food supplies will be depleted and they will die. 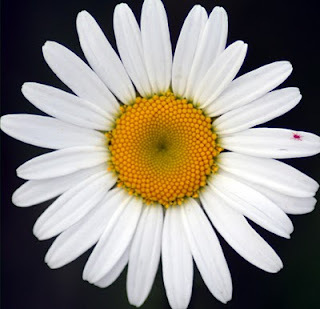 Thus nature has its checks and balances and the relentless cycle will go on, probably long after the extinction of man. 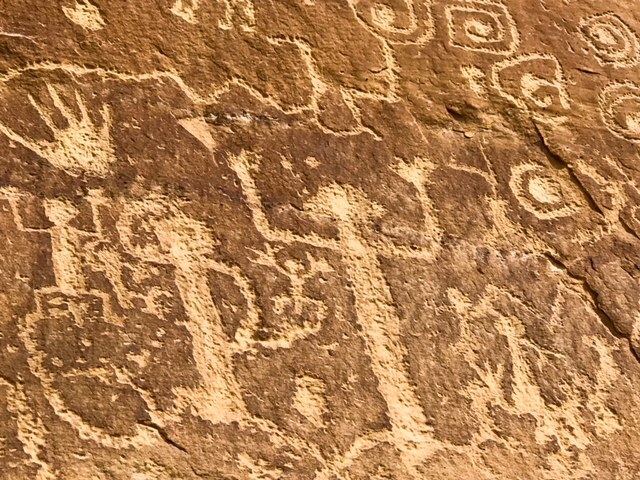 Walking the Petroglyph Trail reminded me of the microscopic nature of our world. One man is a small speck in the canyons out east and not even a pinprick in the vastness of the Cosmos. In this borderless wilderness, we are all destined to wander companionless like Shelley's moon for much of our micro existences. 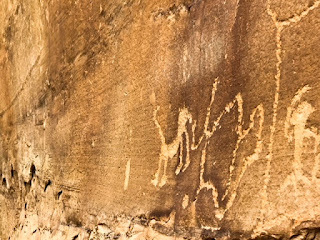 The ancient people recognized as much when they carved the petroglyphs in Mesa Verde in the rocks that were once part of an ancient sea. 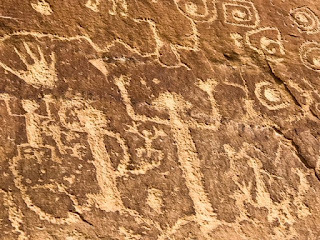 The symbols on the rock include the Horned Toad Clan that denotes the split of the people who migrated here from the other clans and the Lizard spirit symbol whose influence over the people led them into a period of directionless wandering that approached a state of lunacy. Looking over the mesas, I could see how you could lose your mind out here. In a curious way, I could also see how I could regain it. I don't live very far away, but have never visited Mesa Verde. It is only my list of places to go and see!